This is my winning recipe from a cooking competition with goat cheese as the main ingredient. It was in Autumn, and I wanted to create something using seasonal ingredients. I know I should not just stick some Japanese ingredient in here, but Japanese pumpkin is still my favorite. 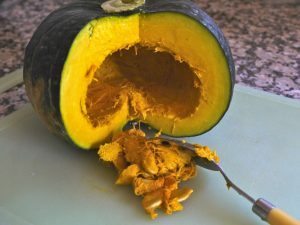 Recently there are examples of Japanese squash, such as Kabocha, Hokkaido, Green Delice, in markets and even in some big supermarkets. If you don’t find these , use pottimarron (red kuri squash in English?). Enjoy the squash and goat cheese flavour collaboration, and also the colour! It’s served with mushroom sauce. This sauce works well with chicken, and beef too. To make the sauce thicker I use and prefer potato starch to corn starch. Both are used to thicken sauces, but the result is bit different. Sauce made with potato starch is much clearer than sauce made with corn starch, and less is needed. If you don’t have potato starch, corn starch can be used for this recipe, just use little bit more. The mushroom! It doesn’t matter what kind of mushrooms you use. Of course the flavour will be different depending on the mushroom, but it could be your original. 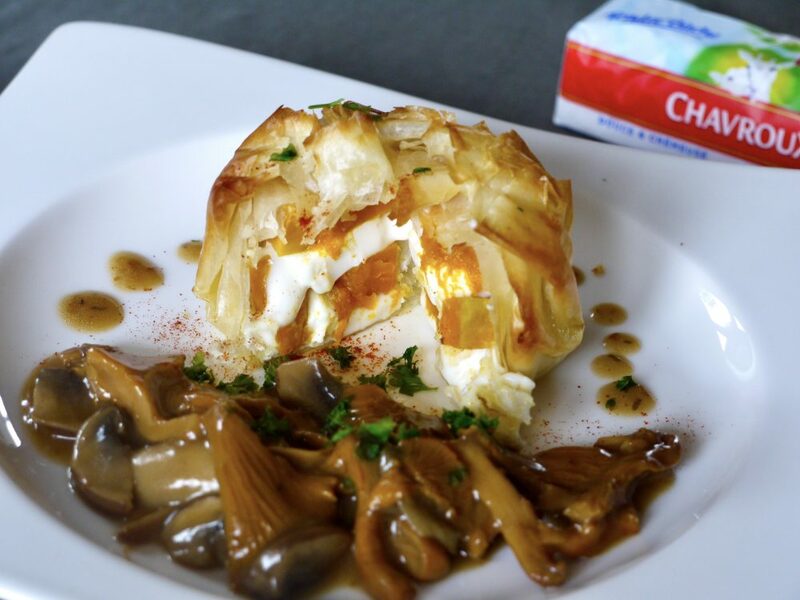 Please try different types of mushroom, especially during Autumn, and create your own meal based on this recipe. < Squash & Goat cheese pie > Preheat an oven to 210 degrees. Cut the squash into 5mm slices and cook in a microwave (800W) for 1minute. Cut the Chavroux into 5mm slices. Melt the butter. Cut the filo pastry into 4 squares. Place the squares one on top of the other (by sliding each sheet a few centimeters and in a slight curve, for a nicer presentation), spread1/3 of the butter on the inner surface . Place a slice of Chavroux and a slice of squash on each pastry, then repeat. Wrap the Chavroux and the squash by folding the filo leaves, and then butter the surface. Bake for 15 minutes in the oven. Serve with mushroom sauce, sprinkle with paprika powder and chopped parsley, if you like. < Mushroom sauce > Clean the mushrooms and cut them by hand. Mix the starch and the water. Melt the butter in a small casserole and cook the mushrooms for 1 minute. Add the white wine and cook for 3 minutes. Add the soy sauce and mirin. Bring it to the boil, cook for 1 minute. Then add the starch and water, stir well.